The Coma has been described as ‘chilling’, which is a perfect word as far as this book is concerned. The story is set in the dream-world of a man in a coma and his struggle to adjust to his new state. 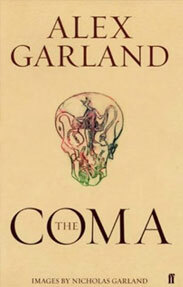 I found the concept very interesting and the writing style in which Garland tackles the subject especially impressive. This is not because he uses long words, or detailed descriptions. On the contrary, his style is simple and the book is a quick read, taking me only two sittings to read cover to cover. The protagonist is Carl, who, getting beaten up on the tube on the way home from the work, is knocked into a coma. When he wakes up, everything seems a bit odd. He has hallucinations and finds himself in different places without knowing how he got there. He worries that he might have brain damage, after all he did hit his head. On his way back to the hospital, the story becomes quite unsettling. After realising that he is probably still in a coma, and needs to find a way to wake up, Carl tries to thinks of memories that might snap him out of it. And that’s when the nightmare really begins. The writing is simple and to the point, with short sentences. There is nothing fussy about the book. However, Garland’s ability to create a dreamlike world, which turns horribly nightmarish, is incredible. He doesn’t have to resort to obviously scary creatures or situations. In fact, The Coma brought back memories of dreams that I had when I was younger. Not horrific nightmares, but the kind of dreams where you are aware that you are in a dream-world and feel as though you will never be able to escape back to reality. Having said that, The Coma isn’t scary and it’s well worth a read…Possibly not just before going to bed though! See how you like it, click on the picture below to get your own copy!